The terms of the offer were pretty clear. The Galaxy S10 purchase page on Samsung's website provided an option to get up to save up to $550 by trading in an eligible device, so long as it powered on, was factory reset, didn't have any cracks, and wasn't blacklisted. You can see the exact offer amounts for all the phones listed via this Wayback Machine link, but the full $550 was offered for the Galaxy Note8 and Note9, the S9/S9+, the iPhone X/XS/XR, the LG V40, and the Pixel 3/3 XL. There were also $300, $150, $100, $75, and $50 tiers. These discounts were applied at checkout, and customers had to ship their old phones back within a week to ensure they weren't charged. 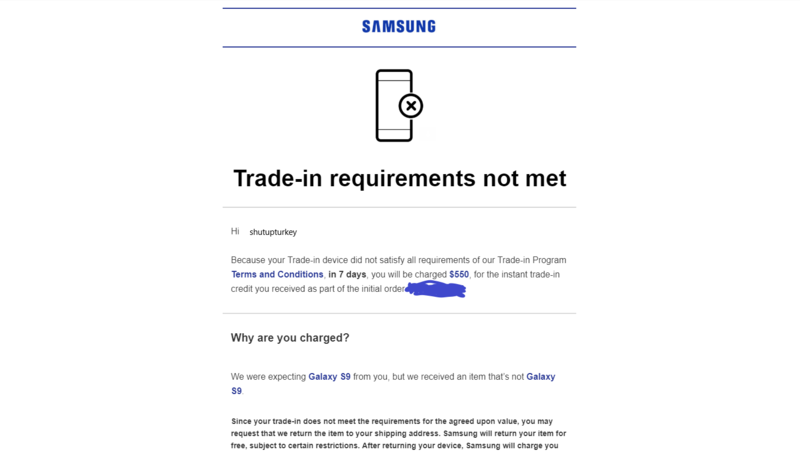 One of the most popular reasons that Samsung is giving for why a trade-in was denied is that the wrong phone was sent in. The reader above, Cliff, made sure to take photos of his Galaxy Note9 before shipping it off, and yet the email he received says that he'll be charged $550 for sending in "an item that's not Samsung Galaxy Note 9." Support informed him that he had sent in a Galaxy S7. One Samsung Community member sent in a Galaxy S9+, only to also be told via support that he had sent in an S7. The same thing happened to a redditor on r/galaxys10 who sent in an S9 with video proof of it being sealed in the FedEx packaging. Another redditor from r/galaxys10 posted an extremely detailed account of his endeavor to get his money back during the Note9 trade-in program after being accused of sending in a phone worth $50, when in actuality, he had sent in a pristine Galaxy S9+ that should have been worth $550. Interestingly, this customer chose to file a complaint with the Better Business Bureau, a method that most would consider to be futile. But after five months of being jerked around, he surprisingly did get the $550 back in the form of a Virtual Visa code. Perhaps most perplexingly, yet another r/galaxys10 redditor who sent in his Note9 was actually told that he sent in a keyboard, and he was sent photos of the keyboard in question that obviously didn't match those that he took of his phone before shipping it off. There are two more examples of this whole "you didn't send in the right phone" thing from Twitter here and here. And this redditor was accused of not having sent the Note5 he'd sent at all. Another popular reason being given is that the phone wasn't factory reset and/or that it doesn't power on and start up/function normally. In several instances, the devices are marked as having both of those issues, which obviously doesn't make any sense — how can you check if a phone was factory reset if it doesn't power on? The same impossible excuse was given to this Twitter user, and neither this guy nor this guy is buying that his phone wasn't reset before he shipped it. This Samsung Community user was told the same thing, but the photo proof that Samsung sent him simply showed the phone on the Wi-Fi screen in setup, which doesn't qualify as proof that it wasn't reset. Another Samsung Community user was told that his phone was not only not factory reset, but also that the phone was cracked. This customer had video evidence that the phone was pristine and reset when he put it in the box, so that doesn't really make sense. Granted, the factory reset issue is a bit dicier given that it's possible for the Google and Samsung accounts to still be on the phone if they weren't unlinked properly, but this is something that Samsung should make clearer as well. Samsung's responses on Twitter have been limited to providing their support phone number, which is unhelpful to say the least. And aside from the one customer who went to the BBB, it doesn't look like these people are planning on getting their money back. Some have been accusing Samsung of running an elaborate scam, though we think it's more likely that this is the work of some unlawful, rogue third-party employees and maybe some poor policies. Whatever the reason is, Samsung needs to stop screwing its early adopters over. 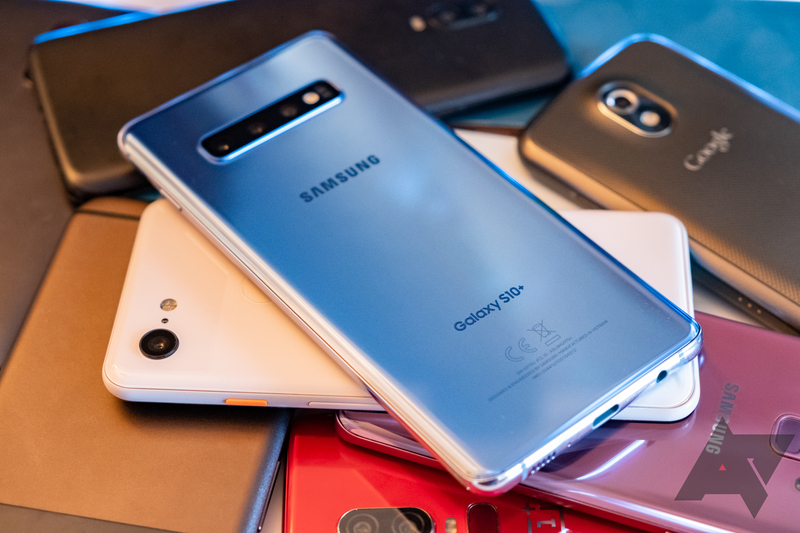 Even if only a small percentage of customers who've used the trade-in program have been affected, this is still a major issue that is costing Samsung's most loyal customers hundreds of dollars each. It's worth noting that Samsung updated its terms of service to say that it will return your device to you if you don't accept their trade-in valuation, but this hassle shouldn't be occurring in the first place. If you're planning on using Samsung's trade-in program (or any company's, really) in the future, you should consider selling the phone privately via services like eBay, Craigslist, or Swappa first. Perhaps you'll be able to get even more money out of your old phone that way. But if Samsung's offer ends up being miles better than anything else, be sure to take plenty of photographic and video evidence of the phone and the box being sealed, and make sure that the phone is completely reset. Chances are that you'll be fine, but better safe than sorry.